CHELMSFORD, Mass.--(BUSINESS WIRE)--There’s a new type of candidate circling the hiring pool: the boomerang employee. Today, in the first study released in The Employee Engagement Lifecycle Series commissioned by The Workforce Institute at Kronos Incorporated and WorkplaceTrends.com, survey data shows a changing mindset about hiring boomerang employees – i.e. someone who left an organization, for whatever reason, and then rejoined that same organization at a later date. In the national survey of more than 1,800 human resources (HR) professionals, people managers, and employees, responses indicate employee engagement should not end once the working relationship is over – especially between high-performing alumni and organizations with a strong corporate culture. However, this era of the boomerang employee creates a unique type of competition for job seekers and new challenges for organizations to maintain relationships with former high-performers. Organizations and workers alike coming around on boomerang employees. Based on the survey data, nearly half of HR professionals claim their organization previously had a policy against rehiring former employees – even if the employee left in good standing – yet 76 percent say they are more accepting of hiring boomerang employees today than in the past. 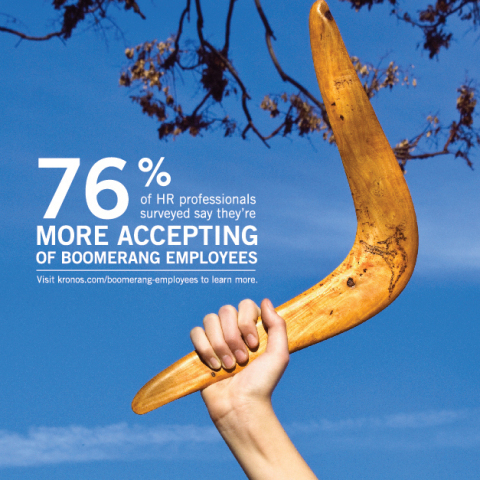 Managers agree, as nearly two-thirds say they are now more accepting of boomerangs. While only 15 percent of employees said they had boomeranged back to a former employer, nearly 40 percent say they would consider going back to a company where they once worked. Looking deeper, 46 percent of Millennials would consider returning to a former employer, compared to 33 percent of Gen Xers and 29 percent of Baby Boomers. In an era where job-hopping amongst young professionals has become the norm, this could suggest that Millennial employees might be leaving organizations too soon. This high hiring rate is not surprising, since HR professionals (56 percent) and managers (51 percent) say they give very high or high priority to job applicants who were former employees that left in good standing. Conversely, only six and nine percent, respectively, say they give zero priority to former colleagues. Boomerangs are not the only type of job seeker adding increased competition, as 75 percent of HR professionals say that customers have also applied for positions at their organization, with 60 percent saying they have hired at least one former customer. Familiarity, easier training, and knowledge of employer are benefits for boomerangs and organizations – yet some concerns linger. HR professionals (33 percent) and managers (38 percent) agree that familiarity with the organization’s culture is the biggest benefit to hiring back former employees, while nearly one-third appreciate that boomerangs do not require as much training as a brand new employee. When employees were asked for the top reason they would go back to work for a former employer if pay was comparable, employee benefits and better career path tied for the number one response (20 percent each). However, this response varied greatly by generation. But while the overall acceptance of boomerang employees has changed direction, HR professionals and managers still have concerns. Nearly one-third of HR professionals and managers claim boomerang employees have a stigma hanging over their heads that they might leave again, and more than one-quarter say these employees may have the same baggage they originally left with. Nearly half of managers say their organization has no alumni communications strategy. HR practitioners, on the other hand, say they use several strategies for keeping in touch with former high-performing employees, including email newsletters (45 percent), recruiters (30 percent), and alumni groups (27 percent). Facebook is the platform of choice for alumni groups according to HR professionals (42 percent), with email (39 percent) and LinkedIn (33 percent) close behind. Kronos currently has more than 180 active boomerang Kronites (Kronos employees) who have returned to work at the organization, including nearly 120 who have been re-hired since 2010. Many boomerang Kronites cite the Kronos corporate culture as a primary reason for returning to the organization, which is reaffirmed by recent employee engagement scores that far surpass industry benchmarks for global IT organizations. Nearly one-third of Kronos hires in the past 12 months have been from employee referrals. Kronos has won several top honors around the world as a best place to work, including recognition from The Boston Globe, Boston Business Journal, Forbes, the Great Place to Work® Institute India, and Canada’s The Globe and Mail. Kronos expects to hire 1,000 employees in 2015, and is actively hiring with more than 300 Kronos job openings worldwide. Be on the lookout for an upcoming Tweet Chat with The Workforce Institute on boomerang employees at #KronosChat. WorkplaceTrends.com is a research and advisory membership service for forward-thinking HR professionals. We have a large database of research covering all aspects of HR, from recruiting to employee benefits to training and development. Through our primary research studies, and collection of secondary surveys, we are following the most important trends and then sharing them with our member companies as they happen. Our corporate members have access to a wealth of knowledge at their fingertips, with real actionable advice. Our goal is to help our members prepare for the future of work, today. Research findings are based on a survey fielded in the U.S. between July 14 and July 22, 2015. For this survey, 1,807 respondents were asked about their thoughts regarding various aspects of corporate culture and employee engagement. The study surveyed three separate groups: HR professionals (601 surveys); people managers (604 surveys); and full-time, non-managing employees (602 surveys). The survey was completed through Lightspeed GMI’s Global Test Market double opted-in panelists who have registered to participate in online surveys. All sample surveys may be subject to multiple sources of error (i.e. sampling error, coverage error, measurement error, etc.). A new study in The Employee Engagement Lifecycle series by The Workforce Institute at Kronos and WorkplaceTrends indicates that we've entered the era of the boomerang employee.